September 3, 2009. 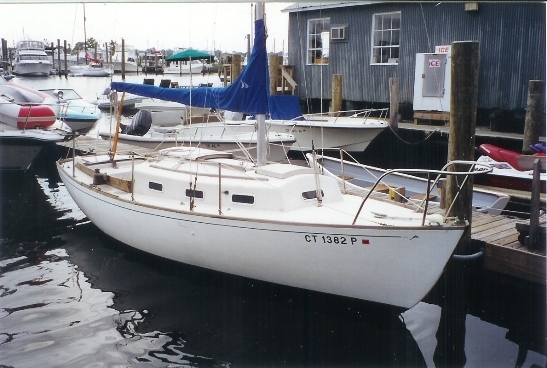 Jim has advised he has bought Cysosure, and has decided to call her WISP - her name back in the late 1960's when she was owned by Ed Smith in Stonington, CT. Jim has a lot of work ahead of him but here, pending Jim's upcoming picture of his fully restored boat (see below), is a file picture we had of WISP (actually then named Enticement) in better times. I bought Cynosure with her trailer and got her to within 12 miles of my house before blowing out a tire on the trailer, which was exciting. More later. Her bilges and cockpit were full of water, about 2” over the sole. We pumped her out a bit. All the original rigging seems to be with the boat and it doesn’t appear to have been modified too much. We are going to return her to WISP. September 14, 2009 Jim sent in an update and 'status' report. 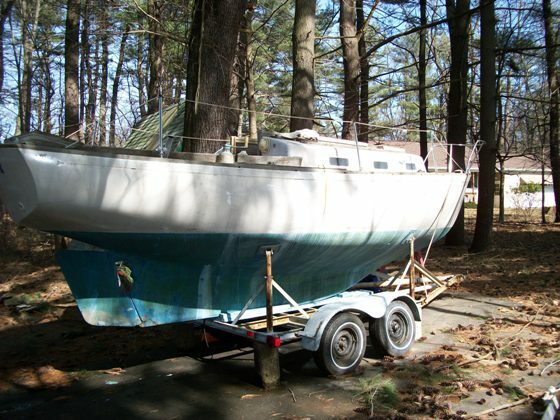 I have been working on the trailer, and aside from putting a good tarp over her and getting the mast off the deck and onto stands beside the garage, I have been doing no boat work and a lot of mechanic-type work. The bearings on two of the four wheels, both front wheels, completey disintegrated, and I took what was left of the spindle to many trailer parts suppliers before confirming that the type of bolt on spindle no longer is made. I have modified modern spindles to mount securely to the trailer frame, which was the only alternative to having new one’s machined or installing an entire sprung axle. Boat work so far: I just got the spreaders off, which indeed were broken. And I measured my forestay for the luff of a headsail, which turns out to be 29’ 7”. A few questions: it doesn’t appear that any of the boat is cored, hull or deck, but instead is just a single (sometimes thin) layer of glass. Could this be so? I will follow up with pics soon. I just have to get the trailer functional again, and make sling poppets. I’m SURE I will have a few questions for you then. I just obtained unfettered access to a MIG welder and mask, and have already spent many happy hours making my trailer ugly. Thanks again so much for the work on the website. It is very well done and easy to navigate. My wife and I are trying to decide on a color scheme for the boat. I think we will stick with white for the topsides, and my vote is for red bottom, no boot stripe, and varnished mahogany for the trim, including the house sides. I will have to replace the cockpit coamings and winch bases, and my vote is for teak. Down below is a real mess. Muddy leaves, mud wasps, and still a good deal of oily black sludge sloshing around. I’ve got to get in there with the shop vac and get to work. January 7, 2009 The Dolphin 24 Brain Trust (names withheld for security reasons) has been working on trying to properly identify the builders of some of the early Dolphins - boats built in 1960 - 1965. 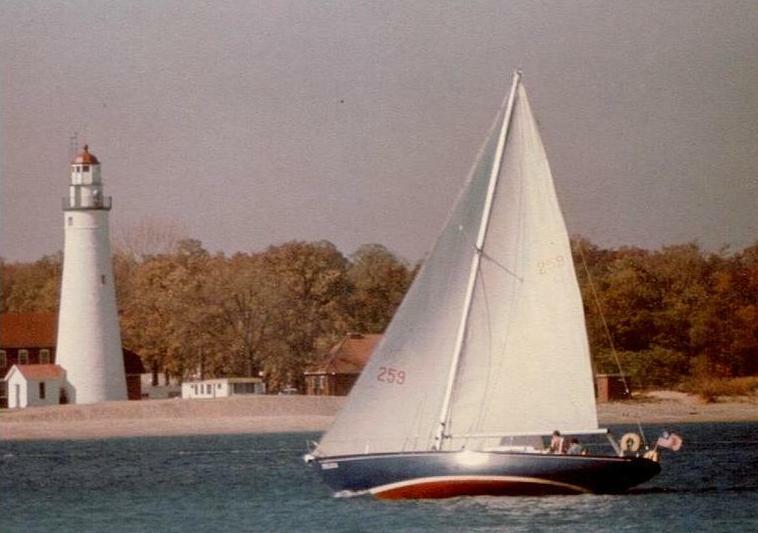 In this period they were all O'Day boats but variously built by O'Day's contractors - Marscot in 1960, Lunn in 1961, O'Day in 1962 forward ( they acquired the Marscot plant), J.J. Taylor and Sons, Toronto, Tripp and Sons, homebuilders using hulls and parts supplied by O'Day, and perhaps even others. These boats were marketed by O'Day initially, then US Yachts, then back to O'Day. When registered, these boats were usually registered as O'Day Dolphins most likely in the year they were bought, not necessarily the year built, and the actual builder may not have been identified, or even known by the first owner. Forty plus years later, without a nameplate identifying the builder, various owner changes masking original details, re-registrations by new owners with erronious file data, winter tarps frustrating off season investigations, etc, this effort can be challenging.. Using physical characteristics visable from photos, the keen eyes of our staff marine architects, and employing the 'scientific method' (construct a theory based on known facts - revise the theory if necessary on new information) we suspect that Wisp is actually a Lunn built boat. 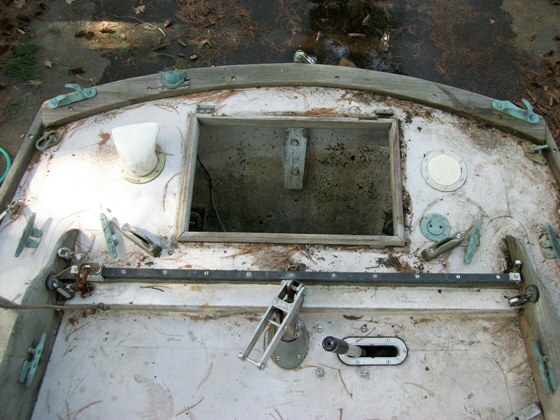 Webmaster Note: On March 23, 2010 we decided Wisp is a Lunn built boat. Wisp has been under investigation, suspected of actually being a Lunn built boat, and accordingly, our staff contacted Jim. We got back his reply - and an update on where she was on her restoration path. Nice to hear from you! Happy holidays. WISP is under cover for the winter. 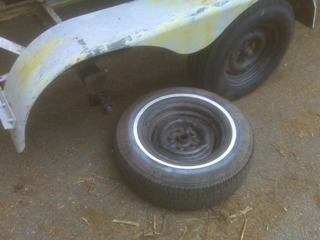 My trailer repairs were unsuccessful, as I am not a welder (I have learned). Thus my forward progress with the restoration has been thwarted temporarily. As soon as the ice thaws I will open her up and resume plucking away, and look for a nameplate. I am sure I will come across something soon, as I will need to dig through every little corner to get her back to shape. I have refinished the companionway ladder with good, flagship varnish. It is teak, and well made, and although stained from diesel fuel, came out looking like a million bucks. 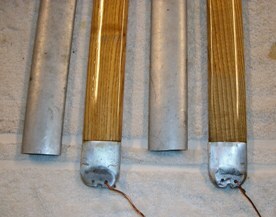 Also, I rebuilt spreaders of ash which are surely heavier than their aluminum originals, but look much nicer too. They were milled to the same exact outside dimensions as the aluminum originals, which were broken off by an enemy of the previous owner. I have to get the trailer squared away, so I can get the boar registered! I need to get the trailer registered too. Much to be done, but she’ll get there. I walk by the hull, hanging out beneath the tarp lashed down around her, at least twice a day and think often of the cool clear water that will slide by her in 6-7 months time. A boat looks much different through a scuba mask from under the keel. March 22, 2010. Jim's been busy and will be getting busier if he meets his June in-water target! Wisp has a Palmer 27 and your webmaster and Jim had an exchange regarding his options Here are the emails consolidated and some edits - hopefully they will add to the overall dialogue. I have a Palmer 27 for an engine! Are these things safe? Bilge pump works! I really should check with my lawyers before answering! Passage has a Palmer 27 also and I am not sure whether or not I'm going to put it back in the boat. It was running fine 10 years ago when we took it out of the boat. We spent $1000 getting her checked over and got new parts that needed replacing. It sits on a bench covered with a plastic tarp, regularly sprayed with WD40 and periodically I pull the rope start rope to turn the moving parts over. It is gas, which is inherently a potential safety consideration, and it is 50 years old. I would definitely have it checked by someone who knows this motor, and also the fuel tank, gas feed lines and blower system. The fact that people still have them means it was a good motor. I have the old catalogues and manuals - the "BH Series and PW-27 Engines" and also a very frail copy of an original "PW27 Operating Instructions" hand dated 6/60. Maybe you (and I) might be able to find decent, running condition small diesels for $1500? 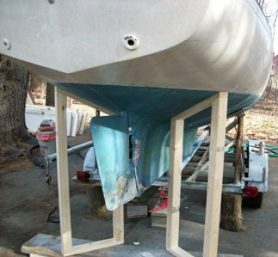 If I haven't decided what to do by the time Passage is ready to go in the water I am going swallow hard and put a removable bracket on the transom and put a used, long(?) shaft 4 hp 2 stroke motor on it that I can take off when I want to, until I decide what to do about an inboard - options - the Palmer, a small diesel, an electric inboard. Exactly. I hate to say it, but I’m leaning toward the Palmer. It’s the least cost while retaining the benefits of an inboard engine, and no major structural modifications since it’s original to the boat. I’m a halfway decent mechanic when I need to be. If this is the manual I need (http://www.oldmarineengine.com/store/index.html) then jeez, for ten bucks with a little luck I can bring her back to life. 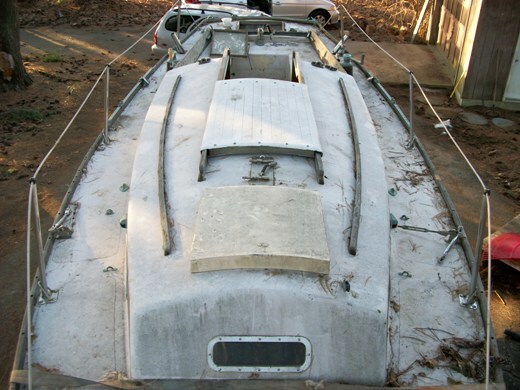 I’m keen to restore the boat to its original, spartan trim. It’s basically a large glass shell bare on the inside except a plywood sole and some benches. There’s no motor box at all, and there never was, which is actually a bonus since I have complete unfettered access to the motor, the tank, etc. though I haven’t really begun to dig in there yet. Despite the lack of furniture, it’s vintage 60’s, and everything appears relatively intact. 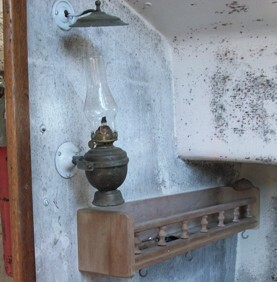 I have the lamp, the head, the bell, and I noticed that the lack of bulkheads and furniture makes the boat light and very roomy feeling, especially when the cushions are all re-sewn and in place. I can imagine it will be quite functional and a cooler and camp stove will serve well for a weekend camp/cruise, which will be its primary use. Webmaster Note - The "Lamp"
I have taken some pictures, which are attached. It almost reached 70 here today so I took advantage of the weather to get started with the hull. 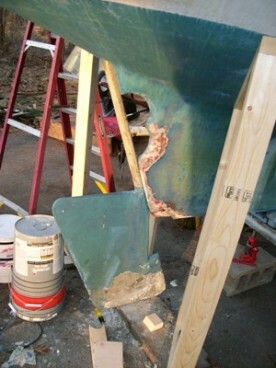 I got at the delaminating fiberglass on the rudder, and it has basically disintegrated from galvanic corrosion. It’s an aluminum rudder, wrapped up in 50 year old fiberglass, which is yellowed and brittle on the outside, and soft and powdery on the inside. The aluminum encased in glass is actually pretty solid over 65 % of the rudder, but at the bottom where it counts the most it failed completely. The rudder post heel fitting came apart, and it became apparent that the rudder must come out and be properly repaired or replaced. 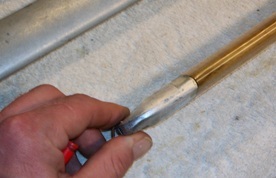 I got as far as removing the rudder post heel, which is heavy cast brass or bronze and in excellent shape, and tiller bracket and dropping the rudder as far as it would go until I remembered you mentioning something about digging.… So this is where I stand. Only way around it is to fix the damn trailer, and haul her to a loading dock or something similar. As for lineage/builder, I’ve given her a good once-over, and no sign of a builder’s plaque or anything like it. There’s no furniture to speak of of and I looked for stamped wood. Even the head is devoid of identifying marks. She was definitely NOT put together from two hull halves - and she has no sheer clamp. I’ll keep my eyes peeled, and as I work through each project I’ll get a better look.. Here are some shots of the trailer poppets, which are positioned incorrectly and causing oil-canning, though no delamination as far as I can see. I jacked the back of the trailer up, built wood poppets to support the weight of the hull, then dropped the trailer down again to relieve the pressure from the poppets. I’m having a welder build new angled braces for the rear poppets so the weight of the boat rests on the keel and the poppets serve to keep her from falling over. March 23, 2010. Thanks to all these great pictures that Jim has sent in the Brain Trust has concluded Wisp is a Lunn built boat. Here are a few more. This is the throttle linkage. On the left we are looking at the starboard wall of the cockpit foot well from the inside. Jim was laying in the starboard quarterberth area. In the right photo you can just see it from the outside. March 24, 2010. Jim sent in the following email (minor edits) in response to our new Palmer 27 page in the Technical Section and, in particular, Mark Steinhilber's comments therein contained. Wow! I couldn’t have asked for a better primer on the Palmer. I’ve got the manual and a parts catalogue on the way. Much thanks to Mark! I will follow his instructions to the letter. Who knows, maybe I’ll get lucky? I’m actually looking forward to getting to know the engine, and it’s good seamanship to know your engine well anyway. I’ll take some pics for the technical section. My wife keeps hiding the camera on me since I have reportedly destroyed two in the last five years, and I’m on camera probation. She’s running out of places to hide it though, and the house is small so hopefully I’ll be more consistent with the pics as her options dwindle. Thanks again to Mark for all that great info. I used to race dirt bikes and have a basic grasp of the mechanics of a two-stroke motor. One modification I may eventually make is some sort of engine box as a sound barrier, but I don’t want to make it too permanent, as eventually a diesel may become feasible and desirable. Plus I need something to keep little kid fingers safe. May 8, 2010. We received the following update (minor edits) from Jim and some pictures. I got the prop shaft out of the boat and have been talking to Dale (Dale Johnson Marine, Mystic, CT- a Palmer 27 guru) about a new shaft and prop. 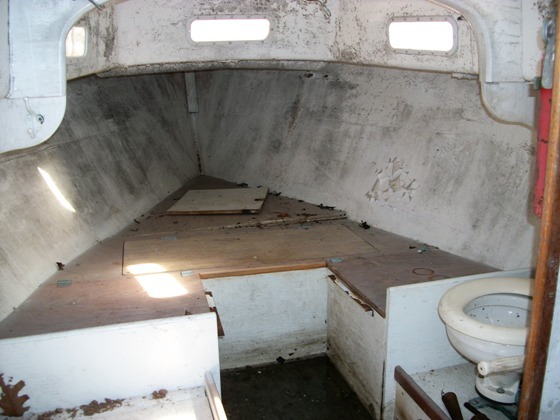 Finally got the bilge dry and cleaned out. I took the battery out and tested it. It’s dead, and according to the purchase sticker on the side, it was bought at West Marine in 2003. Attached are some pics of my new spreaders, rear hatch and companionway ladder projects. The spreader bases are machined to specs taken off the original aluminum, which is laying next to the wooden ones I made. The shroud-end of the spreaders are just the ends of the original aluminum spreaders, capping a tenon, so there will be no pressure to split the wood. 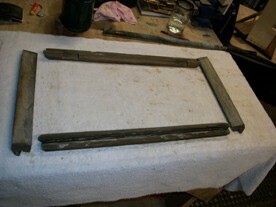 This is the wood from the aft deck hatch frame (see pic above March 20 update). I have to build a new one, because there just isn’t enough meat there on the lip that hangs over the deck rim to screw into. I’m gathering parts for my sling poppets. My welder says he’ll put it together if I find the parts, so I’m on the hunt. Thanks for the pics and specs. I have 4 new spindle/bearing/hub sets and 3 new tires for the trailer. June 8, 2010 Jim sent in the following update. I stripped the hull topsides with Citristrip and a razor scraper. Now sanding with 150 grit to fair gelcoat. Next step: fill and fair with fairing compound, sand w/220 and paint. Neat thing is there is still an impression in the gel coat of the original name, WISP, on the transom, in cool cursive script. You can just barely make it out in the right light. We are going to re-do it, same script, location, and all. Looks like the original color was a really light coffee color, slightly lighter than the coffee gelcoat, with bright red cove stripe and bottom. The gel coat is in fairly good condition. There is a large glass patch, about a foot in diameter, amidships on the starboard side. The boat was holed badly at some point. 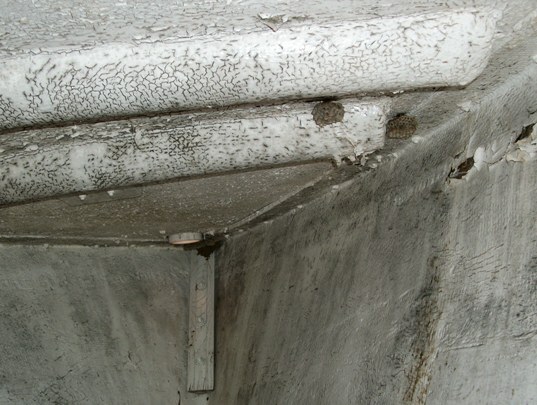 There are several impact sites with spider cracking, and in the hollow parts of the forward section the gel coat has alligator skinned. There are no blisters, at least topsides, and a few significant dings from my scraping. I've got a lot of sanding and fairing to do. By the way, gel coat seems impervious to Citristrip. I even applied it directly, and it did soften the gelcoat to a clay-like consistency, which hardens after wetting and sitting for a few days. I'll be sailing in a few weeks. I had sling poppets made, removed the cockpit coamings and repaired and refinished one side so far. After sanding, the coaming is thin! I will have to replace them eventually. 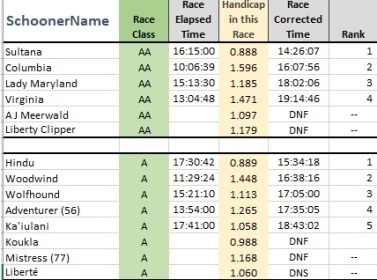 Palmer 27 is a bust. Head is cracked. Dale says I can fix it, but I am going to just remove it for now, and power with an electric trolling motor. Interior is going to get a good scrubbing for now. Hope you are well. Pics soon. June 25, 2010. Wisp is sailing again! The following are a complilation of a couple of emails - edited. Many projects left, no time. Might go sailing anyway, as structural components are fine, just cosmetically a mess. I have been taking pictures, which I will send soon. I did get the engine out of the boat, by myself with no boom for a lift. Just planks, blocks, and a little heave-ho, and out she go! I also finished the rudder repair, the trailer tongue extender, and topsides sanded and ready for paint (though still need to fair out todays gouge which I filled about 2 hours ago). Also, tiller is done, and one side of the cockpit coaming, including the winch base which turned out nice. I am stymied by the stern hatch and very frustrated, but tonight I gotta tape off the hull for paint tomorrow. Should be good weather. Also need to put rudder back on tonight. Postscript: Jim has put up a super group of photos on Shutterfly that are worthy of Wisp's starting her new life. Click the link below, then click pictures. June 26, 2010. Jim sent in pictures of his refinishing efforts with WISP and some interesting comments about launching, mast raising the old fashioned way, etc. Jim also made sling poppits to take his boat off the trailer, and has some interesting stuff to report on this project - patience, we are working on the presentation. If not familiar with this technology click here. Here's a great picture of the "2 dots" in the cove stripe behind the Dolphin tail. For a full size picure and to read about these 'dots', click here George O'Day, The Man Who Loved to Sail in the History Section. After - note coaming, varnishing has started! This is a close up of WISP's cabin house - note the (pinkish) salmon color, not white as in the Cynosure/Enticement photos above. This is a classic early Dolphin color. Jim Homet's Tiki, a 1960 Marscot/O'Day hull # 28 has this same color. Here is Jim's follow up to a separate question about that. " As for the pink, I didn't paint it, but I do like it. The white rubbed / flaked off for the most part, revealing the older paint beneath it. I plan to replicate it when I do the cabin house sides." Some trailering type things to report. My trailer tongue extender did not work. The angle of the drop off was too steep, and it bent the extender such that it would no longer slide into it's sleeve. I taped it to the trailer to get it back home. Oh well. It was a nice try. We wound up chain launching, which is to say that we got the trailer to the edge of the drop-off, chocked the tires, and unhitched the trailer. Then I drove forward about ten feet, and attached the tow chains on the trailer to the hitch receiver frame. Then I pulled forward a little, removed the chocks, and backed down with the chain. The boat launched easily in about four and a half feet of water. Coming out was different. I pulled out twice, because the first time the boat was leaning over to one side and the keel wasn't centered. The second time I wrestled with her a bit, taking a refreshing swim in the process, and she came out perfectly centered and aligned. After our trip, we dropped the mast at the dock, and it was much easier, boat bobbing or not. To raise the mast I merely pinned the forestay and shrounds, backing off the turnbuckles a few inches on the shrouds. I then lifted the mast from it's prone position and marched it forward until it jutted forward where a bowsprit would be. Then my rooftop helper held the mast at the proper angle, allowing me to pin the forward edge of the mast step. Thusly prepared, Mr. Cartop hoisted the mast as far as he could, and I stood on the bow and hoisted some more while my able and willing wife (This woman must be a saint!) and another marina employee hauled away on a dockline made fast to the backstay. Up the mast went. Once the backstay was secure, I tensioned the rig and it was done, save the boom. To lower the mast we just repeated that process in reverse. July 4, 2010. 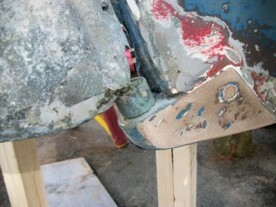 Jim sent in a report on the repair of his aluminum rudder. This is covered in the Technical Section on Rudders. Click here to go there. These are the before and after teasers..
July 11, 2010. Jim sent in a report on his use on WISP of a Minn-Kota electric trolling motor. It is included in our Technical Section/Electric. Click here to go there. July 30, 2010. WISP got back out on the water again. Jim sent in a few pictures. January 12, 2011. Jim has a new toy, I mean truck. Hope you and your family are well. I bought a tow vehicle for WISP. In typical fashion, I found a "deal" and love it! My wife, on the other hand, won't let me drive it for fear the neighbors will see me and recognize me as her husband. WISP sits, awaiting more trailer modifications and an engine. At this point my plan is to contact our Palmer guru and have him rebuild it like you did, then re-install it. 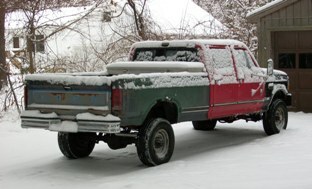 The truck is a 1992 F-350 4X4. It's a diesel with 178,000 miles. Got it for $2000, and so far I've only spent an additional $4,678.22 on her. And counting. February 6, 2011. Jim found a very interesting series of discussions regarding the Palmer 27 engine at OldMarineengine.com. That discussion and the link to the site is posted in Technical Section/Palmer 27 Engine/Discussion. Here is Jim's email. 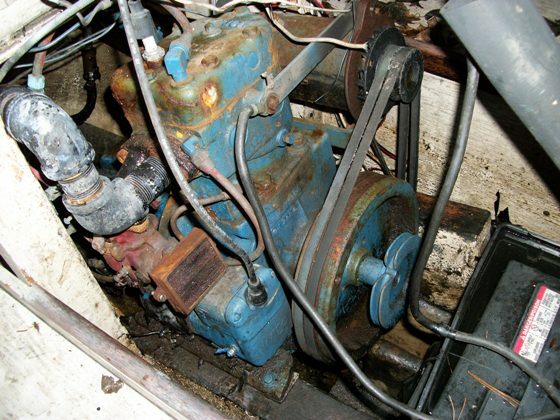 I've been thinking about bringing my Palmer 27 down to Dale Johnson in Mystic, but then I ran across this http://www.oldmarineengine.com/discus/messages/3430/193.html which seems to be an issue to me. My engine actually has a cracked head, which had to come from either an explosion or freezing expansion. Either way, I might spend as much having the Palmer rebuilt as I would re-powering with a small diesel like the BETA10. I'm going to call Pine Island Marina, which happens to be a Beta dealer, to see about a price. Wish I could go get Darwin too. If he'd throw in a few boat stands, I'd take her. April 13, 2012. With the help of our staff (Mark Steinhilber, who has sailed on her) we have determined that Her Ladyship is now Jim Oppy's WISP. We will not drag the reader through all the muddy detail but we had already traced WISP back to Tom Cimini's Cynosure, Herman Jessup's boat (name? ), Milt Holdridge's Enticement and Ed Smith's Wisp. Ed Smith bought a green Dolphin that was on a mooring in the Thames River, painted her white, named her WISP and eventually sold her to the Holdridges. Where did Ed get that green hull Dolphin? Dave Stewart bought Her Ladyship from Commander Larkin, a British officer, and Dave kept her on a mooring on the Thames River. She had a green hull. We've concluded Dave sold this boat to Ed Smith. April 9, 2013. Responding to a follow up and inquiry on his electric motor we got the following email from Jim (minor edits). His comments are included in our Technical Section/electric motors as well. Hi Ron! Things are great. I've been building a timber framed no travel lift** with chain falls. Slowly. Re - researching motors. I can't justify a $7-10K (inboard diesel) motor but have fixated instead on an Atomic 4. They are too big heavy and powerful but they make up for that in initial low cost and overall performance. I had an Atomic 4 in a Cheoy Lee and it was remarkably quiet and reliable. Used ones are plentiful and reasonably priced. I'm leaning in that direction. The Mmin Kota works if you don't really want an inboard auxiliary with power generation, but rather just need an alternative to paddling or sculling. No good for fighting wind or wave or current, really. Perhaps a more powerful model with a true outboard well and a portable suitcase generator for cruising would work? There was something very cool about how powerful and QUIET the electric motor is. I didn't expect that. **Webmaster Note - No travel lifts are (hopefully not too) close to this webmaster's heart - click here to see mine - again. A year ago Jim sent me a note regarding how he has been spending some of his time logging - logging? Yeah, logging. We have a bunch of huge White Pine and Brewer Spruce trees (70-90’ tall, up to 30” in diameter), and several of them were growing close to the house, and in other undesirable places. Instead of spending a ton of money on a tree removal service and a crane, I climbed them, topped them, and rigged them down myself, saving the straight logs in 10, 15 and 20 foot lengths (for lumber and timber framing….building a chainsaw sawmill too). I’m about 2/3 of the way through the project, and plan to frame a timber No-Travel Lift, using chain falls, so I can get WISP off the trailer easily. I had the same safety concerns about a gas inboard. I had a blower arrangement on the cheoy lee, and the starting procedure included running the blower for a full minute before starting. It also had a fuel petcock that had to be manually opened when running the engine, and closed when not. I still had concerns and remember wanting a diesel instead of the gas motor. But I recently went sailing down in Annapolis on a Pearson Vanguard equipped with a rebuilt A-4 from Moyer Marine. Quiet, smooth reliable power. No diesel stench. Low initial price for re-powering compared with any diesel I've been able to find (that I would want). As for safety, I still have qualms about gas engines in boats. However, I would imagine the overall incident rate of accidents from accidentally ignited gas fumes is low. Anecdotal experience tells me it never happens to reasonably prudent mariners. There are a TON of boats out there with A-4's in them, and I've never heard of a single one blowing up (except for reading about it happening to someone else). I am OK with using gas engines aboard, especially for less than half the price of a comparative diesel. It would be fun to make an electric direct drive motor, like this http://electricboatmotors.com.au/?page_id=37 I am sure McMaster-Carr has all the parts one would need, except the shaft and prop itself. February 25, 2016 Responding to the webmaster's email we got the following update from Jim. Hope you are well. Nice to hear from you! We have moved (just across town to a different suburb) and I moved WISP indoors at a friend's steel barn where he stores excavating equipment. She's still on her trailer, which still needs work to be truly road-worthy. When we moved her I cleaned her off a bit but aside from that I have done nothing for a long time. When the weather warms up a bit I plan to get the power plant issue resolved once and for all. Back to a diesel inboard and on the hunt for one. There is a chance I will be acquiring an old wooden Alden schooner, and if that ever comes to pass I will likely put WISP up for sale (after giving her a good spit-shine). I've been chasing an Alden schooner for 20 years and finally have one in my sights - though it is admittedly a very long shot. April 7, 2018 - We got the following update from Jim. Nice to hear from you! WISP was moved a few years ago back to my house in Guilderland again, and remains there under cover. I haven't done any work on her lately, and don't have any plans to in the immediate future. I recently bought a Rhodes Bounty II in Annapolis, and will be sailing her to RI/CT/MA in June. I have begun researching where to moor TELEIA, and I might end up in CT. If I do, I would love to meet for a chat or even a sail if we are close enough. Webmaster Note: Jim, you're on!! I still harbor hopes of restoring WISP, though when remains a question. She is too small for extended cruising with my now teenaged daughters, and the budget is dedicated to the Bounty II. 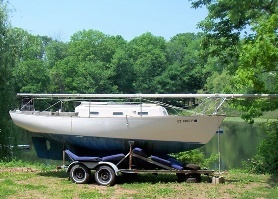 Webmaster Note: Just sniffing around - Staff found this picture of a Bounty II recently For Sale in Annapolis, Maryland. Click here for a larger image, and click here for SailboatData specs. I hope you are well and sailing. Thanks for the note. Postscript: The (above) photo is indeed Teleia! I am excited beyond words, and so proud to be her new owner! She has been maintained pretty well, though not updated in a long while. At the core, I have a gorgeous hull that is solid fiberglass as thick as a plank (she is #13, built in 1958), and the deck is solid glass too. No core anywhere. The standing rigging is about 10 years old, the sails are in very good condition, and the motor (a Farymann R30 2 cylinder diesel) is in remarkably good shape, with low engine hours. That's the good. There is quite a lot of work to be done to get her back into cruising shape. 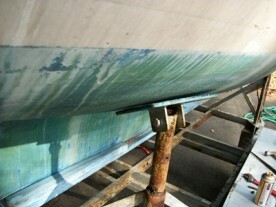 Her wood boom is rotten, the running rigging is all shot, and the rudder is reported to be compromised in some fashion, though a cursory inspection reveals nothing. The electrical system is pretty rudimentary, and I plan to install a water heater and all the attendant nonsense that comes with it. Needs all new batteries, and probably an upgrade in the size of the house bank, as well as charging capabilities. And I am sad to report that the interior is plastered with fake wood. I simply cannot tolerate fake wood on a boat, and plan to remove or cover every piece aboard. There is actually quite a bit of yuck to deal with down below - carpet and so on. I will keep you posted on my whereabouts, and hopefully will see you sailing this summer. Wow! Now THAT is a new dress!! Marionette looks wonderful. (re Marionette's new dress ) Just good enough to eat! No real news re WISP. 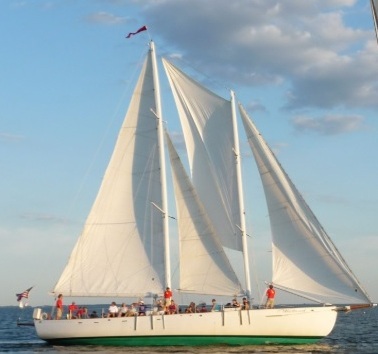 I'm living aboard my boat (a Rhodes Bounty II) and working as crew on the Woodwind schooners in Annapolis (photo right). In November when this job is over I will be working on a 1903 Crowninshield yawl called Witchcraft, and possibly on Mark Faulstick's Alden schooner Adventurer. Thereafter I will be returning to New England waters aboard my own boat OR sailing the fishing schooner Columbia to Ireland. Either way I've launched a new career as a professional mariner. If I could think of a use for Wisp in my life I would collect her and do it immediately. As it stands I need to spend some time and money and get her spiffed up again. She's such a small boat it wouldn't take much. Working on TELEIA is on a whole different scale and I'm learning to be faster.